You should check your car’s oil at least once a month to make sure that there’s enough oil and that it isn’t contaminated. Oil reduces the friction in your engine and keeps it running smoothly. When you check your oil, if it is dirty or smells of gasoline, it’s time for your oil to be changed. 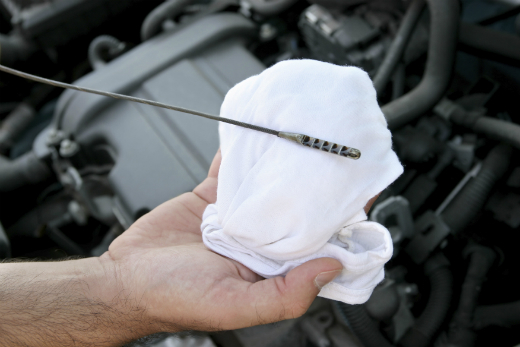 You should also check the levels using the oil dipstick – if you’re oil is clean but only reaches the “Add” part of the dipstick, you’ll need to add more oil. Be sure the engine is cold (or has been off for at least ten minutes) before you check the oil. 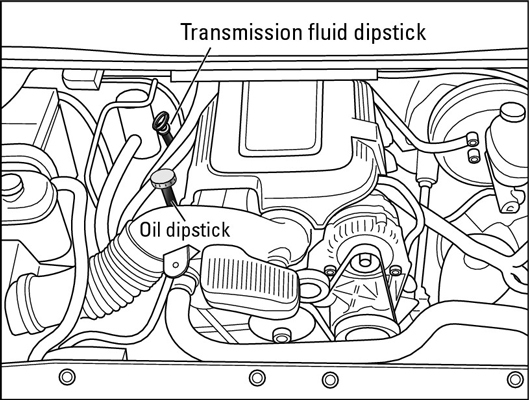 The location of the oil dipstick depends on whether your vehicle has an in-line engine (rear-wheel drive) as shown here. 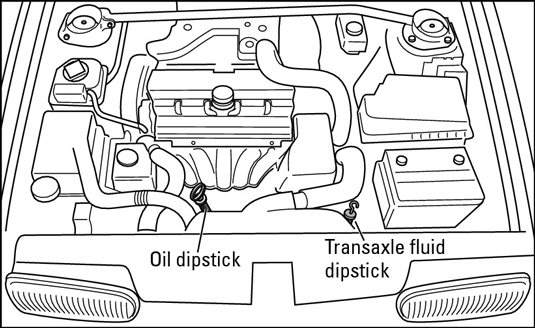 If you have a transverse engine (front-wheel drive) your dipstick should be located near the front of the engine, as shown here. If the dipstick gets stuck on the way in, turn it around. The pipe it fits into is curved, and the metal stick bends naturally in the direction of the curve if you put it back in the way it came out. Pull the dipstick out again and look at the film of oil on the end of the stick. Note how high the oil film reaches on the dipstick and the condition of the oil, and add or change the oil as needed. You don’t add oil into the tiny tube that the dipstick sits in; that’s just asking for messy frustration. Look for a screw-off cap on top of the largest part of the engine. It could be blank or it could be labeled “Oil Cap” or something similar, and it might even indicate which grade of oil you ought to be using in your car. Unscrew that cap and add oil as needed. Oil turns black pretty quickly, but that doesn’t affect the quality. Rub a little between your thumb and index finger, and if it leaves a dirty smudge, it probably needs to be changed. If your oil looks clean enough but only reaches the “Add” level on the dipstick, you need to add oil. You can buy oil the next time you fill up with gas at the service station or you can find it at auto supply stores, supermarkets, discount stores, and large drugstores. See also How to Check Automatic Transmission Fluid and Auto Repair Safety Rules.